Product: Beautiful prawns and oysters,and a selection of other tasty foods. Lovely lunch, the seafood was so fresh which is amazing! But 1.45hrs can be a bit of rushed if it's your (your guest's) 1st visit to Sydney. 2.15hrs would be more realistic to allow passengers/visitors to better enjoy the ambience. Service: Your booking staff was easy to deal with and informative. Upon arrival it was suggested to take photos first up on deck and then sit down to a leisurely lunch which we did and enjoyed. The only negative was I thought a bit more time would be good. Product: The food was fresh and delicious. From the original booking for our group to going on the lunch cruise, the attention of the staff was fantastic. Service: The staff were very friendly and caring and couldn't do enough to assist my mother in her wheelchair. Product: Food was enjoyable but I would expect a more spectacular buffet on a cruise, particularly the desserts which were very ordinary slices. Thank you for the review of your experience of your Cruise. Our aim is always to provide an extensive variety of options maintaining the highest standards of quality, so we are disappointed to read that you felt this was not the case on this occasion. As you know we do strive to deliver world best practice customer service from booking all the way through to the end product – so your review for this is very satisfying to receive. Your comments are very much appreciated by our hospitality staff and a copy of your email has been forwarded onto their department manager. We are sure they will value the positive feedback too. Service: Very friendly & helpful staff.Food was good & plenty of variety.Boat was very spacious & comfortable but a little tired & could do with a revamp inside. Service: The staff were lovely. We had been 12 months prior and enjoyed our time so much we booked again. However this time I felt the variety of food was not as much and there was no commentary as we cruised around the harbour. I was disappointed with that as we took our daughter this time and there were foreign visitors also enjoying the lunch, but had no idea what they were looking at. Product: It would have been nice to know what we were eating. There was a vegetable curry, that was a bit too spicey for my daughter. She put it on her plate not knowing exactly what it was. It would also have been nice to know what cheese was on the board. Tags please. Thank you for the review of your experience of your Cruise. Our Buffet Lunch Cruise includes GPS commentary, which provides a general insight into the history and fun facts of the harbour. All dishes should be labelled and we sincerely apologise if this was not the case on this occasion. Please be assured your feedback has been forwarded to our hospitality manager for review. Service: Great service from staff at King St Wharf. Even after they made an error, they were very apologetic and went to a lot of trouble to ensure the error was corrected. Product: A nice buffet that I really enjoyed but it did not have any WOW factor. Service: The cruise left right on time. The staff were welcoming, friendly and professional. The buffet was fresh, delicious and plentiful. Overall the dining room was comfortable and clean. The ladies toilets were modern and clean. We had a lovely time. Thank you! Product: A great variety of fresh and delicious food including the seafood. The amount of dessert choices were just right. Product: The advertised fish and mussels were missing from the food on offer. Also, there was not much variety in the types of cheeses on offer. Everything else was fine. Service: This was my second lunch cruise so I was more delighted than surprised by the friendly professionalism of all crew members.The food was excellent and abundant. I will be dining again. Product: The range and quality of food were excellent. Table service was professional and unobtrusive. Thank you for the review of your experience of your Cruise. Our aim is always to provide an extensive variety of options maintaining the highest standards of quality, so we are disappointed that you felt this was not the case on this occasion. We always encourage guests to talk to the Cruise Director on board if they have any concerns, especially regarding food, drinks and service as they will be able to solve the problem immediately. Please be assured your concerns have been forwarded to our catering and hospitality manager. Product: The picture says 100 words... and the food was so fresh and the supply continued. Excellent value for money. Service: Yes had a wonderful time service and food great would come back again for sure. Would recommend to anyone. Service: Amazed by the efficiency of the movement of ferries in and out of the terminal. It seems to run like clockwork. The help at the ticket office was very much appreciated. The lunch cruise was very good from beginning to end. Service: I had booked for 36 people for my mums 60th birthday party. We have been on the Captain Cruise for the Seafood buffet lunch before which I was very impressed with, however, unfortunately this time I was extremely disappointed with the quality of food and the poor variety of food. I was extremely embarrassed in front of my friends and family making them pay $85 per head for terrible quality and terrible variety. A seafood buffet should include grilled fish, cold crabs or bugs, smoked salmon, oysters, and cold prawns. Unfortunately at this event, the only seafood offered was smoked salmon prawns and oysters. Also the non seafood options were terrible. The vegetable curry was awful, it was so obvious the veggies were from the frozen variety and their texture was tasteless and resembled cardboard. The salads were lacking substance and the roast ham was sliced roughly and was so salty. I have enjoyed RSL food for 1/4 of the price over this buffet. It was so sad that mum didn't enjoy the food at her 60th birthday and I will never book an event or take the gamble that the quality will be as good as it used to be. It was way too expensive for the poor variety and so embarrassing for your lovely staff to be serving such a boring lunch. Product: My above feedback will explain. Service: Good variety of food. Pleasant crew. Good information for the tour. Product: Great variety . Nice and hot. Service: We both thoroughly enjoyed ourselves, and the food was wonderful lots of choices. Service: The service at the table was good but not exceptional. More help with drink service would have enhanced the experience. Product: The quality of the seafood was first rate, although some people in our group felt that the replenishment of the serving plates was slow to happen, considering that the cruise only lasted two hours. The full complement of desserts was not available to all of our group as these were not in great abundance and not replenished. Thank you for the review of your experience of your Cruise. Our aim is always to provide an extensive variety of options maintaining the highest standards of quality, so we apologise you felt this was not the case on this occasion. We always encourage guests to talk to the Cruise Director on board if they have any concerns, especially regarding food, drinks and service as they will be able to solve the problem immediately. Please be assured your concerns have been forwarded to our catering and hospitality manager. Service: Food was great, staff were fabulous. We very much appreciated the staff making my cousin's birthday special by bringing out a cake and singing happy birthday to him. Product: I would have liked the option to add a beverage package onboard. Service: The food was excellent. The groups that attended were interesting to talk with, and the harbour spectacle is always worth raving about. Service: The cruise around the harbour was good, but we could have been inform in regards to the lunch arrangement. Product: Seafood lunch was o.k., but we could have been informed of proceedings for getting our lunch. Service: Booking for 35 was a simple process and the seating was perfect. The food was very delicious and plentiful. Service: Well organized. The buffet luncheon was very good, food plentiful. Product: Plenty of choice ang good quality. Service: Bar staff were slow at serving& seemed I bit confused regarding people’s drink orders. Product: Seafood was great. It did not run out as well. Service: Yes i certainly would,the service was fantastic. Product: The food was beautiful and plentiful. Lovely cruise. Beautiful boat and friendly staff with delicious cocktails. It was advertised as a seafood buffet however there was only smoked salmon and cold prawns as the seafood - no fresh fish or scallops or any other seafood. Only chicken and curry and rice and salad. I was disappointed, as I’m pescatarian (I don’t eat meat, only fish) and also celiac so I can’t have gluten - which meant I was limited to smoked salmon and salad and a couple prawns. Service: The service on the cruise by the buffet staff was excellent - the bar staff seemed a little lost at first - could not find drink lists and had to wait for someone to come and help when we paid cash. The greeting staff were good but allowed large groups of overseas tourist on before others who were in the queue. All tables see allocated so I couldn’t see why they had to have precedence over other guests. Product: Good variety, continuously replenished know one would have gone hungry. Very courteous staff and very obliging when asked for assistance. Extremely good value for money. We had an overseas visitor so the commentary was also a good option, as well as the diverse meal. Product: Good service and choice of food. Thank you for the review of your experience of your Cruise. As you know we do strive to deliver world best practice customer service from booking all the way through to the end product – so your review for this is very satisfying to receive. Your comments are very much appreciated by all our hospitality and catering staff and a copy of your email has been forwarded onto their department managers. We are sure they will value the positive feedback too. We also offer customers the option to purchase a coffee made by a barista on board. This can be made to order and customised to your convenience. Food good but main course things like oysters (superb) ran out a little too quickly. I thoroughly enjoyed the lunch experience on board. Everything was as I was expecting it to be! Beautifully presented with helpful waiters/waitresses. The commentary was most interesting giving me information I had not known about. It was a beautiful day and the sailing was very smooth. Service: From purchasing tickets online to the lovely food and quick service to our seats once on board, this was very good. The only down side was the 'circus' in getting aboard. Signage was not available to say that seafood buffet patrons were to gather at the bow of the vessel, and the other type of cruise were to gather towards the stern. An employee of the company (who was patient and trying his best) was assailed by many patrons requiring clarification with lots of shouting of directions and inability to be heard. Felt like being herded like animals...this could have been better handled to have a better experience. Product: The seafood was very fresh, and there was lots of it, near empty trays were replenished regularly, there was a good choice of other food to pick from. The vegetable curry was particularly good. Was not made aware that there was a coffee machine and filtered coffee available in another area. Thank you for the review of your experience of your Cruise. Our aim is always to provide an extensive variety of options maintaining the highest standards of quality, so we’re pleased that you enjoyed this aspect of your cruise. We can assure you that our staff are trained to provide our customers devoted and efficient service, including during our boarding process. We always encourage guests to talk to the Cruise Director on board if they have any concerns, especially regarding food, drinks and service as they will be able to solve the problem immediately. Please be assured your concerns have been forwarded to our catering and hospitality manager. Service: The service was very good but there could have been more plates ready for people to use. Product: The seafood was great but the rest of the food was nice but pretty ordinary. Service: Easy on line booking experience. We boarded on time and were shown to our window table which had great views of Sydney harbour. We were served drinks quickly by a friendly and helpful member of staff. The buffet lunch was exceptional - great choice of seafood and salads. There was also a hot option (did not sample) as love seafood. Nice range of desserts, cheese and crackers. Coffee/tea available. Enjoyed informative and entertaining commentary about the harbour and it’s history. Great views of the Opera House and bridge. Would strongly recommend. Thank you for the review of your experience of your Cruise. We were disappointed to read that you felt that the variety of options on your cruise wasn’t to your standards. Our aim is always to provide an extensive variety of options maintaining the highest standards of quality. Service: The staff went out of their way to ensure that all went well and I was impressed with the way your staff reacted to a great influx of people especially at boarding time. Your bar and waitress staff were exemplary offering top up drinks without having to wait until the drinks were finished. It was my wife's birthday and the cabin waitress, without any request being made, produced a small cake with a sparkler - very thoughtful and to the delight of my wife. The buffet food was good but somewhat frantic due to the number of guests at the buffet table. All in all the buffet cruise was great value and I would recommend anyone to take the cruise. The staff in the booking office were very pleasant and courteous as usual.This was the 5th or 6th year that 3 of my friends and I have been on the Seniors Seafood Buffet Cruise. Last year I complained about the absence of crab on the buffet and also that the price had risen by another $5.00. This year again there wasn't any crab on the buffet. In previous years there was a couple of meat dishes and a vegetable curry which was quite nice but there wasn't any meat except for some ham swimming in some kind of liquid and some chicken drumsticks also swimming in some kind of liquid. Also the price had risen by another $4.00 making it $59.00. I don't believe that the food was up to standard and there wasn’t much of it. Next year the price will probably be well into the $60s mark and I will be seriously considering if it is worth attending again. The quality and variety of the food was even lower than last year and I’m sorry but I can only give 3 stars as the standard has dropped since 2017 when I would have given 5 stars. Thank you for the review of your experience of your Cruise. Our aim is always to provide an extensive variety of options maintaining the highest standards of quality, so we’re disappointed that this was not to your standards on this occasion. Our menu is listed on our website and we always encourage customers to view this to understand the inclusions on their selected cruise. We believe our pricing to be equal to any contemporary dining establishment in Sydney. As you know we do strive to deliver world best practice customer service from booking all the way through to the end product – so your review for this is very satisfying to receive. Your comments are very much appreciated by all our hospitality and catering staff and a copy of your email has been forwarded onto their department managers. We are sure they will value the positive feedback too. Service: Staff was very helpful and efficient; and the food was delicious. But drinks were expensive and we had to ask for salt. I left my credit card behind but nobody bothered to email/phone me about it. All the staffs are hard-working. Service: Very clean boat/ship, Lovely friendly polite staff and excellent staff. Sorry not on my mobile. Product: We were very satisfied and loved the fresh oysters, the pork was excellent as was the chicken legs and all salads. Service: The service and the food were great. The staffs were nice and friendly. I’d have a wonderful lunch and beautiful view with my family. Product: Oysters were fresh and sweet. The prawns were great too. Service: Would definitely take this cruise again. Great way to show visitors our beautiful harbour. The food on the buffet was lovely. Product: There was a very good choice of food. Very enjoyable. Service: Staff were absolutely fabulous, very friendly, very attentive. Bent over backwards to make sure we were entirely happy. "We" being a group of 4 senior ladies. Product: Enjoyed the lunch but to be honest not the best I have ever had. Thank you for the review of your experience of your Cruise. Our aim is always to provide an extensive variety of options maintaining the highest standards of quality, so we’re disappointed that this did not meet your standards on this occasion. As you know we do strive to deliver world best practice customer service from booking all the way through to the end product – so your review for this is very satisfying to receive. Your comments are very much appreciated by all our hospitality and catering staff and a copy of your email has been forwarded onto their department managers. We are sure they will value the positive feedback too. Service: As always Captain Cook has done it again! I've been to another harbour cruise with Cook but this was my first with the seafood buffet. The food was fresh and delicious, customer service excellent and the cruise itself awesome. Flew from Melbourne for a special occasion and am so glad I did. Product: For the price of a buffet excellent. Service: The service was excellent and could not be faulted. Your Seafood Buffet Lunch was one of the best that I have had and compared favourably with any seafood buffet that I have had in restaurant's onshore and who most probably have greater facility's than what you have on board. I can only say on behalf of myself and the company I was with, Thank You for a most pleasant day on the harbour. Product: Drinks a little expensive, but there again it was Sydney Harbour. seafood was excellent and very fresh definitely value for money. Service: Late start, waiting in sun for 15 minutes to board. When set sail, food was not ready/ organised, waiters running around looking disorganised and frantic, not knowing what each was doing. Nobody replenished our water the whole trip. Product: Not enough variety, deserts ran out quickly, not replenished quickly enough for such a short trip. Thank you for the review of your experience of your Cruise. We can assure you that our staff are trained to provide our customers devoted and efficient service. We always encourage guests to talk to the Cruise Director on board if they have any concerns, especially regarding food, drinks and service as they will be able to solve the problem immediately. Our aim is always to provide an extensive variety of options maintaining the highest standards of quality, so we apologise if you felt this was not the case on this occasion. Please be assured your concerns have been forwarded to our catering and hospitality manager. Service: Well organised, good service, excellent cold seafood, good salads. Less than perfect was the hot food selection where the only really attractive dish was the chicken which was off the menu for one of us because it contained chilli. Product: Easy to book, irritating to have to look up starting times. I should not have purchaes the drinks package, one of us is a non-drinker. Purchasing individual drink would have been cheaper. 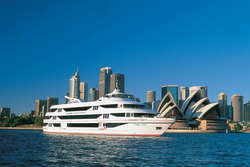 Service: The cruise was a good overview of Sydney Harbour and the food served was delicious. Service: Personnel agréable et disponible. Beau buffet. Croisière sympathique. Product: all good oysters and salmon prawns what more could you want ? Service: the information the history provided on the tour was good. what i didnt enjoy was the few options for the buffet lunch especially for halal eating guests. Service: We thought the service was very good. The staff were all pleasant, the food was plentiful and fresh. However the coffee wasn't hot enough or tasteful. We used this cruise to celebrate our 40th wedding anniversary! Product: It was good value for money, very relaxing. Product: Could have more variety..
Service: A very pleasant experience,boarding was flawless and quick, window seat, good commentary, only downsize, there could have been more non seafood options on the buffet. Product: Easy to book, I preferred it when the ticket was on =line rather than having to queue to get tickets at wharf. Service: I had read a lot of the negative reviews before booking and was a bit nervous I’d picked the wrong company but our experience was awesome! The service was great, very attentive and we had absolutely no problems getting drink service. The food was really nice and there was plenty of it. The Staff were really friendly and good with my 2 kids (3 and 8 years old). The views of course amazing. Overall totally worth it! And would definitely recommend. Product: Great food, variety and plenty of it. We took my elderly parents on the lunch cruise. Everyone was helpful. Very relaxed atmosphere with the right amount of commentary. Service: Excellent service from booking right upto the seating arrangement of our small group of 12. The food and selection was fresh and delicious. Everyone was extremely happy and cannot wait to return. Service: Second time I've dined with Captain Cook Cruises and enjoyed it just as much this time round. The cruise itself was informative and provided great views of iconic landmarks and the food was delicious with a good range considering it was only for lunch. Service staff were professional and friendly. Product: Worth every penny - loved the lunch! Enjoyed our time on the boat and would do it again. Service: It was 5 star service and good hospitality. Product: Food was nice and more than enough on the tables. Service: Nice food and service but the extra $15 per person for a window seat is too much. $10 per person would be reasonable. Product: Food and service is good. Extra $15 per person for window seat is too much. $10 per person would be reasonable. I booked table for eight. Only four are facing the window the way the table was set up. Service: Good food. Good service. Fantastic View. Food is very fresh and enough to get full. Fantastic views for the whole harbour. It is worth to try. Service: Superb. A very enjoyable experience. The service excellent, polite and very professional. Product: The food was first class and plentiful. Staff very helpful, food very good and commentary interesting. Product: Needed more continual bringing out of food. Ran out of Ham and not replenished. Delicious food otherwise. Thank you for the review of your experience of your Cruise. We are pleased that you enjoyed the views, commentary and service on your cruise. We continually monitor all aspects of the production chain including receipt, storage, distribution, cooking and presentation to ensure a top quality and consistent product is presented to our guests, so we apologise if you felt this wasn’t the case on this occasion. We can assure you that our staff are trained to provide our customers devoted and efficient service. We always encourage guests to talk to the Cruise Director on board if they have any concerns, especially regarding food, drinks and service as they will be able to solve the problem immediately. Please be assured your concerns have been forwarded to our catering and hospitality manager. Service: Captain Cook Cruise have always accommodated me and my carer with access onto the boat as I'm wheelchair bound. I always book for the dinner cruises every year, however this was my first lunch cruise and will continue to choose Captain Cook Cruises for my annual end of Christmas celebrations. On the whole an excellent outing. We would have liked our table cleared a little earlier. In the end I approached an attendant to clear the first course of plates so we could enjoy the rest of our meal. We were celebrating my son's 50th birthday. Service: For a buffet, there was far too few options. For vegetarians, there was only a spicy vegetable curry which contained no protein. For vegans, the salads had cheese. There was no non-dairy milk for coffee to purchase (i requested soy milk, a standard at all places now). The ham, one of only 2 meat options separate from the seafood, ran out an hour into the cruise. It took the chef over half an hour to produce more, by which time you had to be quick to collect dessert because eveything began to be packed up 20mins before arriving at circular quay. The automated coffee machine started to produce watery hot chocolate with minimal cocoa (compared to earlier in the cruise) towards the end. A stunning boat, friendly attentive staff, but terrible food options given the cost. Product: For a buffet, there was far too few options. For vegetarians, there was only a spicy vegetable curry which contained no protein. For vegans, the salads had cheese. There was no non-dairy milk for coffee to purchase (i requested soy milk, a standard at all places now). The ham, one of only 2 meat options separate from the seafood, ran out an hour into the cruise. It took the chef over half an hour to produce more, by which time you had to be quick to collect dessert because eveything began to be packed up 20mins before arriving at circular quay. The automated coffee machine started to produce watery hot chocolate with minimal cocoa (compared to earlier in the cruise) towards the end. A stunning boat, friendly attentive staff, but terrible food options given the cost. Thank you for the review of your experience of your Cruise. We apologise that our buffet didn’t meet your expectations on this occasion. Our aim is always to provide an extensive variety of options maintaining the highest standards of quality. We always encourage guests to talk to the Cruise Director on board if they have any concerns, especially regarding food, drinks and service as they will be able to solve the problem immediately. Please be assured your concerns have been forwarded to our catering and hospitality manager. Service: Drinks waiter confused our order and brought us a $55 bottle of wine (after charging our credit card) instead of a glass! Disappointed not to have the crab salad we had last year. Having said that we had a great outing, food was excellent and the trip was good value. Would certainly recommend it to friends. We have done the buffet lunch around Christmas 2 years in a row and would do it again next year. Product: Excellent value, fresh food. Whole experience was very good and have recommended to other family members. Staff were helpful and friendly. One small disappointment- we were surprised that the dessert buffet did not have a Christmas theme, considering this was just two days before Christmas and I am sure that many of your customers were enjoying the event as part of their extended Christmas celebrations. Service: Our group have taken this buffet lunch cruise 4 times over the past 5 years and this year were very disappointed with the experience. The buffet was quite limited, and not a lot of choice. One of our group had been on the exact same cruise 2 weeks earlier and the choice was better. The desserts were very poor with limited variety of fruit (the cheapest available it seemed) and the drinks were extremely expensive........$11-$12 for a glass of wine is highway robbery. On top of all that, the section was only half full and we were still crammed in with barely room to move, especially eating with no room to move your arms. Whilst we appreciated the window seating, we could not move from our seats backing on to the window as there was no room to move the seat back even a few centimetres to get out !! The staff came around taking our serviettes 45 minutes before the end of the cruise, like they were stopping guests from further eating. We will seriously not consider this again next year for our group. Product: Very disappointing choice, limited compared to previous cruises with same company. Expensive drinks. Thank you for the review of your experience of your Cruise. Our aim is always to provide an extensive variety of options maintaining the highest standards of quality. We believe our pricing to be equal to any contemporary dining establishment in Sydney. We always encourage guests to talk to the Cruise Director on board if they have any concerns, especially regarding food, drinks and service as they will be able to solve the problem immediately. Please be assured your concerns have been forwarded to our catering and hospitality manager. attentive friendly staff, plenty of space around our tables, good food. Service: Friendly staff who were polite and helpful. Ensured we had a memorable occasion. Product: Great variety of foods and appropriate sized cake portions to enable more variety. Plenty of fresh fruit. Delicious ham. Water for tea not hot enough to enjoy. Service: We received poor customer service. There was only one food station for the busy cruise and we needed to wait I. Long lines. Food ran out and wasn’t replaced quickly or left completely. Staff were in attentive and needed to be ask for assistance. Not good enough! Product: Very ordinary and long waits not enough vegetarian food or assistance from staff at the buffet. Thank you for the review of your experience of your Cruise. We can assure you that our staff are trained to provide our customers devoted and efficient service. We always encourage guests to talk to the Cruise Director on board if they have any concerns, especially regarding food, drinks and service as they will be able to solve the problem immediately. Please be assured your concerns have been forwarded to our catering and hospitality manager. Service: The service was outstanding and food was amazing such a variety and seafood was so fresh, Totall recommended and I am going to book again for the new year as we enjoyed it so much. Product: Food and sea food was so fresh and just beautiful. Service: On time, food was good, service good. Product: Good choices and plenty available, hot food was hot and cold food cold, as they should be. Thank you for the review of your experience of your Cruise. We believe our drinks pricing to be equal to any contemporary dining establishment in Sydney. We continually monitor all aspects of the production chain including receipt, storage, distribution, cooking and presentation to ensure a top quality and consistent product is presented to our guests. Please be assured your comments have been forwarded to the catering manager. Thank you for the review of your experience of your Cruise. We continually monitor all aspects of the production chain including receipt, storage, distribution, cooking and presentation to ensure a top quality and consistent product is presented to our guests. Please be assured your comments have been forwarded to the catering manager. The actual cruise was great. The food was also good also maybe a little more variety would be better. I would have rated it 4.5- 5 stars stars however the manager was very rude, it was a lady, we explained we booked a buffet lunch and was told by Olivia the person we booked with that it would be 3.5hr cruise and after 2.5 hrs we were asked to get off the boat. when i tried to explain this manager was extremely rude did not want to listen.She just wanted to know why we didnt get off when she asked. Her service was absolutely discussing. Its a shame she ruined the experience for our group of 15. The manager needs to work on the people skills and service. The rest was just great. Thank you for the review of your experience of your Cruise. We can assure you that our staff are trained to provide our customers devoted and efficient service. We always encourage guests to talk to the Cruise Director on board if they have any concerns, especially regarding food, drinks and service as they will be able to solve the problem immediately. Please be assured your concerns have been forwarded to our hospitality manager. Service: Service was great. Food was ok but thought seafood would of been better was on the small side. Sights on the cruise was great. Would recommend the window seat option. Overall t the cruise was great. Service: Food excellent. So was commentary though rather hard to hear at times because of raucous group at next table. Product: Food varied and of excellent quality. Service: Food and service was impeccable! Thank you for the review of your experience of your Cruise. Our aim is always to provide an extensive variety of options maintaining the highest standards of quality. Our menu is listed on our website and we always encourage customers to view this to understand the inclusions on their selected cruise. We can assure you that our drinks prices reflect the majority of establishments in Sydney. We also offer a range of bar packages which provide an unlimited number of beverages for the duration of the cruise which may be a suitable alternative. A child's ticket price is more than 45% less than a full adult fare. Service: From booking the lunch and dinner cruise's we found every thing to be very professional and special thanks to all your staff who were very helpful. Product: The selection of food was excellent. Service: Service by staff was excellent. Access to food and quality of food would be considered ordinary. Product: Comments on food are applicable as well as access to! Found that commentary was not totally audible and at times we had already passed what they were describing. Thank you for the review of your experience of your Seafood Buffet Lunch Cruise. We continually monitor all aspects of the production chain including receipt, storage, distribution, cooking and presentation to ensure a top quality and consistent product is presented to our guests, so we are disappointed that you felt this was not the case on this occasion. Our GPS commentary is used to provide a general insight into the history and fun facts of the harbour. This is set at a volume so as to not interrupt or be obtrusive to the conversations and ambience of fellow passengers, whilst still at an appropriate volume for customers to listen to at their leisure. If customers prefer a live, personalised and interactive commentary, we provide live commentary on our Harbour Story cruises. Service: Excellent, staff were friendly and attentive. Food was delicious. Product: Seafood buffet was delicious, lots of variety. The food was great, but the kinds of food were less than I expected. Service: The staff on board were exceptional, making my Mum’s 90th birthday amazing. Our table placement was good. Also the surprise birthday cake and the singing was really great. My Mum was so surprised. There was a good variety of good food and was replaced as soon as the plates were empty. A very pleasant day seeing the sights on the harbour. Product: Plenty and good variety. Could go back as many times as you want. The staff were always replenishing the empty places. Product: My father loved the oysters , my mum said she also enjoyed her meal. Lovely Lunch cruise. Shame about the frozen prawns and lack of dessert for most. Nice trip around the harbour. Also took the Taronga Park tour ...Great service schedule and crew. 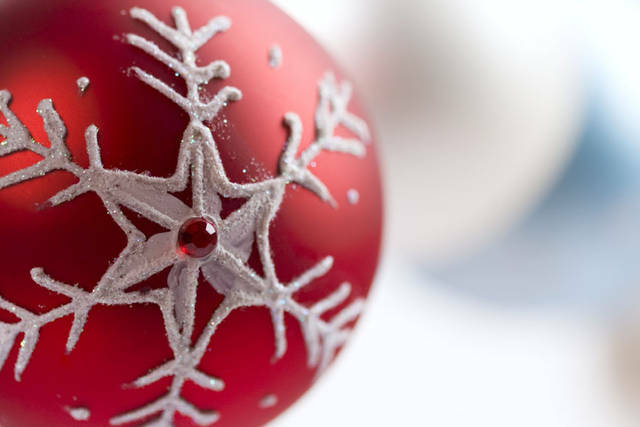 Service: Wonderful experience we had for our staff Xmas party. Food are nice and fresh. We were really enjoyed. Service: Food was very good, would have preferred a roast meat instead of ham. Seafood was very fresh and tasty. Good variety of salads and breads. Dessert was average, but did love coconut slice and mini fruit cups. Product: Very enjoyable lunch and friendly crew. Money well spent. Service: Polite staff willing to help. Product: we were happy we the service thats all thankyou. 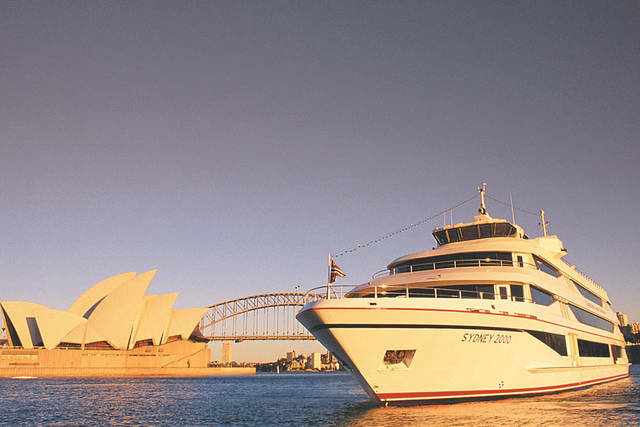 Service: The service was excellent,food was fresh and the cruise well timed and took in Sydney Harbour perfectly. My group had a wonderfull time and would recommend the cruise to anyone. Product: Faultless,wonderful service and a great experience. Service & staff were excellent, welcomed on board and shown to our table. Softdrinks for kids a little expensive but I'm sure that would be the case with most similar services. Service: Great service and well organized. Product: Great selection of food to cater for all members of the family. Service: Staff were without exception attentive, professional, friendly and accomodating. Food and beverages were plentiful and of great quality. The entire experience was very impressive - we enjoyed the relatively casual lunch cruise buffet. The decor was stylish and well maintained. Commentary about the harbour and attractions was welcome but not intrusive, we listened at times and ignored it easily when in our own conversation. Product: Seafood was plentiful, nicely presented and topped up promptly by staff as required. We thought the quality of shellfish was very very good. Salads and Warm dishes were also appealing and tasty. Tea and Coffee freely available and dessert with cheese and crackers also attractive and tasty, with staff kindly ensuring we knew about it (we were seated near to main buffet, well away from dessert station). Thank you for your review of your Captains Dinner Cruise. We can assure you that our staff are trained to provide our customers devoted and efficient service. We always encourage guests to talk to the Cruise Director on board if they have any concerns, especially regarding food, drinks and service as they will be able to solve the problem immediately. Please be assured your concerns have been forwarded to our catering and hospitality manager. Our GPS commentary is used to provide a general insight into the history and fun facts of the harbour. This is set at a volume so as to not interrupt or be obtrusive to the conversations and ambience of fellow passengers, whilst still at an appropriate volume for customers to listen to at their leisure. If customers prefer a live, personalised and interactive commentary, we provide live commentary on our Harbour Story cruises. Service: We spent a good time with beautiful scenery and fantastic food. I strongly recommend this course. Product: All the food was fresh and tasted good. Service: We booked a bar package. The service was a bit slow at first, we had no drinks for 15 mins after boarding. Felt like we were being rationed. Eventually we got served but I would buy my own next time. Very relaxing. Thank you for your review of your Buffet Lunch Cruise. We can assure you that there is no limit to drinks served in conjunction with the responsible service of alcohol. Our aim is always to provide an extensive variety of options maintaining the highest standards of quality. We always encourage guests to talk to the Cruise Director on board if they have any concerns, especially regarding food, drinks and service as they will be able to solve the problem immediately. Please be assured your concerns have been forwarded to our catering and hospitality manager. The two young women who served our table were amazing. friendly and helpful throughout the cruise. Service: We experienced very efficient service on arrival and during the luncheon. The charm and warm greeting by our attendant during the lunch, especially her extra effort made by Mickie when she learnt that it was to celebrate my husband's birthday by creating a small cake from the dessert, complete with candle and brought to our table with 'Happy Birthday' song. This just completed the wonderful experience we enjoyed. Product: The seafood, plus additional salads was excellent - fresh and nicely served. Service: Well organised. The food was great although we did run out of desert but it was replenished a bit later. The drinks were very expensive! Product: The actual cruise and buffet lunch was good value, but the drinks were very expensive - $54 for 3 jugs of softdrink and about $55 for one bottle of wine. Service: Disappointed...we have been on lots of Captain Cook cruises and have loved them. This cruise was well below par. Food was sloppy and cold even though we were one of the first tables to eat after leaving Darling Harbour Wharf. Staff were standing around chatting and looking totally fed up, no energy or engaging with customers. The ship looked very untidy, items thrown in corners and just general mess. There was no music or running commentary. I took my husband for his birthday as we have many times before for family celebrations ( Xmas, Mothersday, Easter and Vivid also), but I am sad to say we will probably not be returning after the sad and disappointing cruise we had on Sunday. Product: Hot food was cold even though it was on the bain maree...Curry and chicken dishes were sloppy and unappetising. Service: We celebrated my mum’s 70th on the boat for a seafood luncheon for 26 people. It was a wonderful experience. A little short time wise could of gone and extra 1/2 hour but the food and service was lovely. Thank you for allowing us to celebrate this special day with you. Product: Food was lovely and plenty to go around. Service: We staff were wonderful and at your service (not that we required much service). Product: It was delicious, I feel one extra dish would of been great. Service: Service was exceptional, from welcome us onboard, during the cruise and when we left. Service: Lovely seating with a large window. Friendly crew. Exceptional food over and above what was expected. Nice timing. Not too long. Very happy experience for a 60th birthday with a number of youngies. Service: The food and trip was great but your head chef cracked up quite loud about a few different things one being people weren’t lining up right. We were only told go help yourself no directions were given that there is a proper way to leave me up. Service: The service? You mainly service yourself at a buffet. Product: It was all average food to me. Nothing stood out or was particularly special. The views were good... that’s it. Thank you for your review of your Seafood Buffet Lunch Cruise experience. We continually monitor all aspects of the production chain including receipt, storage, distribution, cooking and presentation to ensure a top quality and consistent product is presented to our guests. Please be assured your concerns have been forwarded to our catering manager. Service: overall pleasant experience though we would have wanted more mint brownies and it was not replenished. The buffet table was small for the amount of people on the cruise. The prawns were small & you could tell they had been frozen and defrosted as the quality of the prawns was poor for a ‘seafood buffet’. Service was good though & the staff were very friendly. Thank you for your review of your Whale Watching experience. We always monitor the weather forecasts so that our cruises can view the whales when the weather is at its best, but at sea the weather can change unexpectedly. This appears to be the case in this instance, and we apologise for this unexpected development in your cruise. 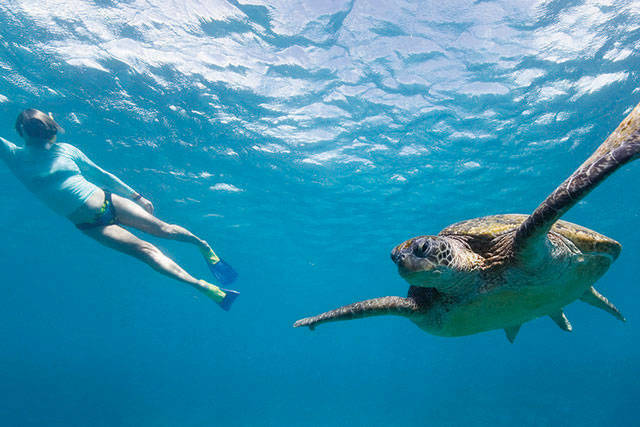 We hope that our whale guarantee can fulfil your hope of viewing these incredible creatures. Product: Food was so so..paying for view not quality. Thank you for your review of your Seafood Buffet Lunch experience. We pride ourselves in the service we provide to all our customers and we are happy to read that you had a good experience in this regard. We can assure you that all our products are sourced and prepared fresh so we were disappointed to read that this was not up to your standards. Please be assured your comments have been forwarded to our catering manager. The seafood buffet luncheon cruise was perfect. It's not just for tourists, it's great for locals too. The food was delicious with a great selection and the service was professional, friendly and efficient. It's a lovely way to spend an afternoon sailing on the harbour. Service: They did everything very well. I would recommend it to anyone who is thinking of taking a lunch cruise on Captain Cook cruise. God bless you all. 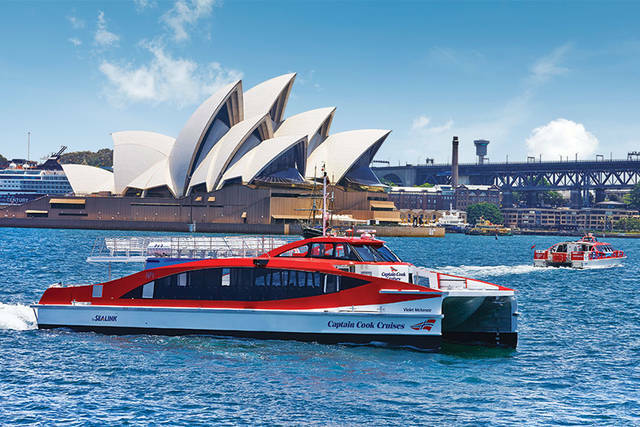 Service: Great thing to do for sightseeing Sydney from the harbour areas..
Service: I would have given 5 stars except because of the train fiasco, i rang ahead as I didn't think my friend and would make it even though we managed to get a taxi from Turella train station it was touch and go. I asked the reception if they could still let my niece and husband board ( as they were over from Perth and i wanted to shout them the cruise )and if we didn't make it so be it that we would forfeit those fares. The answer I got was no even though i quoted the booking number etc. My email address was the same name as my credit card. I think in those circumstances with the rail network going down there could have been some understanding shown. We did make the cruise with a few minutes to spare and thoroughly enjoyed it as did my Niece and Husband. Product: It's just always a wonderful way to see the harbour and enjoy a lovely lunch. Service: The ship was enormous, seating and views spectacular, staff so friendly and helpful, food was amazing! Would definitely recommend to anyone and would totally visit again. Service: Fresh seafood. Friendly staff. Have been on this cruise twice and will definitely go again! Product: Seafood variety and freshness! Service: I would definitely recommend Captain Cook cruises. We had a lovely day and found the staff outstanding. What a beautiful harbour to cruise around. We did start out with a small problem where my daughter bought along an ice cream cake for my birthday and asked the staff to put it into the freezer. The cake was only put in the fridge and it melted. Your staff not only replaced our cake with another one but also gave us a free bottle of wine. And not only that we were given an extra trip around the harbour - just our little group on our own. We were more than impressed with the exceptional attention the staff on board provided us with. Every one left the boat so happy and loved the day. I don't think I have every been treated so well by staff anywhere. They were so lovely. Thanks again for a lovely day. 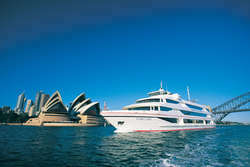 Product: A fantastic day with Captain Cook cruises on our beautiful harbour. Only one complaint the food does not cater enough for children. We had a 9 year old with us and not much appealed to him even though we'd paid a lot for his meal. We all thought there could have at least been fish and chips or chicken and chips or even pasta that appeals to children. Maybe worth looking into. Service: Service was good,plenty of food but the seafood was poor quality. Thank you for your review of your Seafood Buffet Lunch experience. We pride ourselves in the service we provide to all our customers and we are happy to read that you had a good experience in this regard. We can assure you that all our products are sourced and prepared fresh so we were disappointed to read that this was not up to your standards. The crew could not have been more attentive and helpful. We loved the glass of whisky with sparklers to celebrate my husband's birthday, The seafood was plentiful and fresh. All in all a very enjoyable day. Service: The lady who helped serve us during our cruise was fabulous!! Forgot her name but she was lovely! Product: It was good although I was dealt with by a few representatives & sometimes had to repeat myself because the last person had no idea what I was querying. Punctual, nice food, good service, window seats and did well in catering for my group. Service: The service staff were friendly and helpful. The quality of the seafood buffet was very ordinary, quite disappointed. Product: Small seafood and very little choice. Thank you for your review of your Seafood Buffet experience. We were delighted to read that you found the service staff to be friendly and helpful. We continually monitor all aspects of the production chain including receipt, storage, distribution, cooking and presentation to ensure a top quality and consistent product is presented to our guests and we were disappointed to read that this was not up to your standard. Service: Very tasty seafood buffet BUT windows need washing please? Thank you for your review of your Seafood Buffet experience. We are happy to read that you enjoyed our wonderful seafood buffet. Our windows are cleaned thoroughly and regularly, however the salt water can sometimes make the windows appear otherwise. We believe our pricing to be equal to any contemporary dining establishment in Sydney. If you experience any negative behaviour from other customers, we encourage customers to talk to the Cruise Director as he/she can address the issue immediately. The food, service and music were all good and the view was fantastic! Thank you for your review of your Seafood Buffet Lunch Cruise. Our windows are cleaned thoroughly and regularly, however the salt water can sometimes make the windows appear otherwise. We can also assure you that all our food is sourced and prepared fresh. Service: Great experience thank you! We booked the steak and lobster dinner cruise. Was disappointed that the lobster was cold and not tender at all. Steak over cooked. Not worth the price we paid. Thank you for your recent review of our Sunset Steak and Lobster Cruise. We continually monitor all aspects of the production chain including receipt, storage, distribution, cooking and presentation to ensure a top quality and consistent product is presented to our guests. We apologise that this wasn’t the case on this occasion and please be assured your comments have been forwarded to our catering manager for review. Service: Service is OK. I booked a seafood buffet but didn't really meet our expectation of a seafood buffet. It's like a normal buffet in a 2-3 star hotel with seafood on the side.... The duration seems to be a bit short considering guests need to eat and see the views. We were mostly rushing up and rushing down.... Overall, it is good for a one-time experience. Product: Not the seafoos buffet I was expecting. And the little seafood that was there don't taste very good. Thank you for your recent review of our Seafood Buffet Lunch Cruise. Our aim is always to provide an extensive variety of options maintaining the highest standards of quality – so we’re very disappointed that you felt this was not the case on this occasion. Please be assured your comments have been forwarded to our catering manager for review. Our Seafood Buffet Lunch Cruise operates for 1 hour and 30 minutes. If customers would prefer a longer duration of cruising, then we also offer a variety of dinner cruises that cruise for a duration of 2 hours and 30 mins, to 3 hours and 30 mins. Thank you for your recent review of our Seafood Buffet Lunch Cruise. We were disappointed to read that you felt the food on your cruise wasn’t to your standards. Our aim is always to provide an extensive variety of options maintaining the highest standards of quality. We always encourage guests to talk to the Cruise Director on board if they have any concerns, especially regarding food, drinks and service as they will be able to solve the problem immediately. Please be assured your concerns have been forwarded to our catering and hospitality manager. Service: Excellent services, all staffs are friendly and helpful with all everything. Product: Excellent foods Excellent services, nice view. Service: Seafood buffet with not much seafood & no red meat !! Dessert was very poor too & top ups were slow. Drink service was very slow had to ask for our wine 3 times, by the time we got it we had almost finished eating. Thank you for your recent review of our Seafood Buffet Lunch Cruise. We were disappointed to read that you felt the food and beverage service on your cruise wasn’t to your standards. Our aim is always to provide an extensive variety of food options maintaining the highest standards of quality. As you know we do strive to deliver world best practice customer service from booking all the way through to the end product – so your review for this is dissappointing to receive. We always encourage guests to talk to the Cruise Director on board if they have any concerns, especially regarding food, drinks and service as they will be able to solve the problem immediately. Please be assured your concerns have been forwarded to our catering and hospitality managers. Service: I didn’t like the food. Thank you for your recent review of our Seafood Buffet Lunch Cruise. We were disappointed to read that you felt the of food on your cruise wasn’t to your standards. Our aim is always to provide an extensive variety of options maintaining the highest standards of quality. We always encourage guests to talk to the Cruise Director on board if they have any concerns, especially regarding food, drinks and service as they will be able to solve the problem immediately. Please be assured your concerns have been forwarded to our catering and hospitality manager. Staff waited for a couple joining us who was late by at least 10mins. Thank you. Thank you for your recent review of your Seafood Buffet Lunch Cruise. We were pleased to read that you found the service on your cruise was to your standards. We always endeavour to cater for all our passenger’s needs, so we’re pleased that you found this on this occasion. Overall the service is good, and I did enjoy the lunch with my girlfriend on Captain Cook Cruises. The recorded audio introduced all the iconic buildings (e.g. Sydney Opera House & Harbour Bridge) and spots in detail. Yet, I think the frequency of staff collecting plates could be faster so that customers do not need to try and manage the table's space so hard. Service: The food was O.K. but not much left after the locusts had descended. Next time we'll get on at Barangaroo and not Circular Quay, before most of the food is gone. There could have been more dessert options. The drinks service was very slow. I didn't get my wine until I had finished my lunch. Product: Not bad value for a couple of hours on the harbour. Service: Booked the Harbour Cruise for Mother's Day Lunch. Everyone thoroughly enjoyed the cruise and the buffet lunch. The staff were also attentive and very accomodating. Thank you. Product: The buffet was great value for money for the adults. However the price for the children was quite high and there wasn't much for young children to eat. Considering it was Mother's Day, and obviously children would be celebrating with their mothers, I think there should be some consideration in the menu for children. Service: Well organised embarkation and seating procedure. Product: I highly recommend Captain Cook Cruises, we booked a Mother's Day cruise for the seafood lunch buffet, the food and cocktails are delicious, the cruise was clean and the staff are very friendly. Thanks for my great day!! Staffs are very friendly, food was great and the scenery is amazing!! Service: It was a good experience but there were a couple of things that could be improved. The quality of the complimentary coffee/tea provided is pretty ordinary. Even the purchased latte was pretty ordinary. At this time and age of coffee machines, surely some quality good coffee can be offered. The other point to note is that the windows of the boat was dirty. It was really not that great to go on a viewing cruise with dirty windows. Service: Excellent service. Excellent food. Excellent experience. Just don't increase the prices. Product: Beautiful food. Fresh seafood. Yummy oysters. Wait staff and greeting staff were very friendly combined with professional appearance and service. Service: The seafood buffet was not very good with only 3 options of seafood and the deserts picked over without replenishment. However, the cruise around the bay was nice. I would check out some other options first if you want to have this type of experience. Product: The seafood buffet was not very good with only 3 options of seafood and the deserts picked over without replenishment. However, the cruise around the bay was nice. I would check out some other options first if you want to have this type of experience. Thank you for your recent review of our Seafood Buffet Lunch Cruise. We were disappointed to read that you felt the food on your cruise wasn’t to your standards. Our Seafood buffet offers: Chilled oysters, Ocean prawns, Mussels, Smoked salmon and Steamed Barramundi. The menu is available on our website so our customers can make an informed decision prior to booking. Our aim is always to provide an extensive variety of options maintaining the highest standards of quality. We always encourage guests to talk to the Cruise Director on board if they have any concerns, especially regarding food, drinks and service as they will be able to solve the problem immediately. Please be assured your concerns have been forwarded to our catering and hospitality manager. Product: Good quality food. OK variety to choose from. Table service average. No bread and butter plates. Tired looking place mats on table. Cutlery not wrapped. Food ok. Probably would not go for the buffet next time. Might be better with the 2 course meal. Could not hear the recorded female commentator in the early part. Noisy customers. Cold coffee. Beautiful Sydney Harbour. Thank you for your recent review of our Seafood Buffet Lunch Cruise. We were disappointed to read that you felt the service and commentary volume on your cruise weren’t to your standards. We can assure you that our staff are trained to provide our customers devoted and efficient service. We always encourage guests to talk to the Cruise Director on board if they have any concerns, especially regarding food, drinks and service as they will be able to solve the problem immediately. The Sydney 2000 has undergone a recent refurbishment to reflect a contemporary and modern look, remaining aesthetically pleasing allowing guests uninterrupted views of magnificent Sydney Harbour. Please be assured your comments have been forwarded to management and your feedback is greatly appreciated. Our GPS commentary is used to provide a general insight into the history and fun facts of the harbour. This is set at a volume so as to not interrupt or be obtrusive to the conversations and ambience of fellow passengers, whilst still at an appropriate volume for customers to listen to at their leisure. If customers prefer a live, personalised and interactive commentary, we provide live commentary on our Harbour Story cruises. Product: You pay for what you get. Service: The staff were friendly, very informative and prompt. Service: A most enjoyable cruise - nice and leisurely. And the seafood buffet was wonderful. Product: Delicious food, a good variety and nicely presented. The harbour cruise, the lunch it was excellent. We are planning an evening dinner cruise, thumbs up. Lovely, relaxing and informative cruise around the harbour with a delicious lunch as well. We took our elderly parents who thoroughly enjoyed it also. Pleasant courteous staff. The buffet was pleasant and you just can’t beat the scenery. Great value for money. A must if you’re a visitor to Sydney or a resident. Service: excellent service all the way. Was gifted a Seafood Buffet Lunch Cruise last year form my son and had a great time. Decided to take my mother on the same cruise. Apart from the food it was like comparing chalk to cheese. The vessel was not as good, the staff were not as good or as welcoming as the previous cruise. And the biggest disappointment though was the commentary. A third of the commentary was not played, and what was played was inaudible. Thank you for your recent review of our Seafood Buffet Lunch Cruise. We were disappointed to read that you felt the vessel, service and commentary you received on your cruise weren’t to your standards. Our vessels are always reviewed to maintain a modern image, including a recent renovation of the Sydney 2000; the vessel our lunch cruises operate on. We can assure you that our staff are trained to provide our customers devoted and efficient service. We always encourage guests to talk to the Cruise Director on board if they have any concerns, especially regarding food, drinks and service as they will be able to solve the problem immediately. Please be assured your concerns have been forwarded to our catering and hospitality manager. Our GPS commentary is used to provide a general insight into the history and fun facts of the harbour. This is set at a volume so as to not interrupt or be obtrusive to the conversations and ambience of fellow passengers, whilst still at an appropriate volume for customers to listen to at their leisure. If customers prefer a live, personalised and interactive commentary, we provide live commentary on our Harbour Story cruises. Yes it was a great way to finish our time in Sydney. Service: Service was very nice and pleasant. Thank you for your recent review of your Seafood Buffet Lunch Cruise. We were pleased to read that you enjoyed service on your cruise. We believe our pricing to be equal to any contemporary dining establishment in Sydney so we apologise you felt this wasn’t the case. As you know we do strive to deliver world best practice customer service from booking all the way through to the end product – so your review for this is very satisfying to receive. Your comments are very much appreciated by all our hospitality and catering staff and a copy of your email has been forwarded onto their department managers. We are sure they will value the positive feedback too. Service: Great day. Staff were friendly and helpful. Food was amazing and there was plenty to choose from and it was always topped up. Service was great. Food was good. Service: Friendly, polite and informative. Wonderful day and have spread the word! Attentive, polite and friendly. Didn't have to ask for anything. Food was good. While the commentary (recorded) was informative, sometimes it was wrong. Service was very good and was pleased to see the buffet being replenished with more food in particular the prawns.